We are located in south Anchorage, Alaska, near Dimond Blvd and Old Seward Hwy. 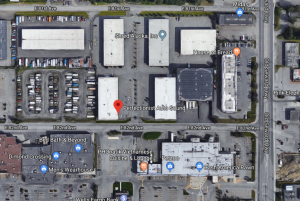 Just behind Bed Bath and Beyond is a warehouse district, in which we are located in building D. If you are coming from the airport, take International Airport Rd heading east, turn right at Old Seward Hwy, turn right on East 82nd Avenue. If you are coming from downtown Anchorage, head south on the Seward Hwy (AK1) and take the Dimond exit and turn right onto Dimond Blvd. Turn right at Old Seward and take the first available left turn onto East 82nd Avenue.